Instant downloads of all 946 LitChart PDFs (including The Wanderer). LitCharts assigns a color and icon to each theme in The Wanderer, which you can use to track the themes throughout the work. 5. Afloat. Sophie writes that she and her fellow shipmates have begun their journey—The Wanderer has hit the waters. They are heading towards Block Island, where it seems that they’re going to stop, though Sophie doesn’t say why. Sophie also tells us that Uncle Stew came up with the idea that everyone aboard the ship should teach something to the whole crew. Sophie decides that she’s going to teach her “boat family” the stories that her grandfather Bompie has taught her. The stop at Block Island, as we discover later, is the first in a series of stops Dock makes with the intention of encountering an old love interest of his. Sophie’s decision to teach Bompie’s stories to her family starts to show how she perceives the world through stories and fantasies. 6. Slugs and Bananas. Chapter 6 marks Cody’s first log entry. He says that his father (Mo) is driving him crazy—all he does is lay around all day, not helping with anything, but this doesn’t stop him from barking orders at everyone. Cody writes that his aunt and uncle adopted Sophie, but Sophie talks about them as if they were her real parents. He adds that Brian thinks Sophie lives in a dream world. Cody’s story begins by revealing the conflict at the heart of his relationship with his father. Mo’s laziness and bossiness irritate Cody, who is often the target of Mo’s anger. Cody also gives us information which Sophie hasn’t revealed—she never told us she was adopted. We also see how others perceive Sophie as living in a “dream world”—an important concept for the book. A radical difference between Brian and Sophie’s personalities is further revealed here. While Brian is obsessed with maintaining a sense of rigidity and order, Sophie actually wants to escape order—to go to where time seems like it’s all connected, where it’s one big present moment, not something divisible into the measurable minutes Brian constantly counts. 8. The Dolt and the Orphan. Cody then writes about how he, Brian, and Sophie were walking along the island they visited with the dinghy, and how Brian mocked Sophie about her foster mother not being her original mom. He says he couldn’t tell whether Sophie just ignored Brian or didn’t hear him at all; Sophie didn’t miss a beat after Brian’s comment, and quickly picked up a rock, challenging Brian to see if he could throw as far as she. After Cody and Sophie took the trip with Brian, they decided to take another one—but this time without Brian. Sophie’s reaction to Brian’s comment about her mother is strange. It seems like she must have heard it, since she reacted by distracting from it, but by not acknowledging the comment at all, it seems like Sophie doesn’t really register it at some level. It’s like her mind prevents her from really hearing it, and instinctively urges her to do something that will distract her. 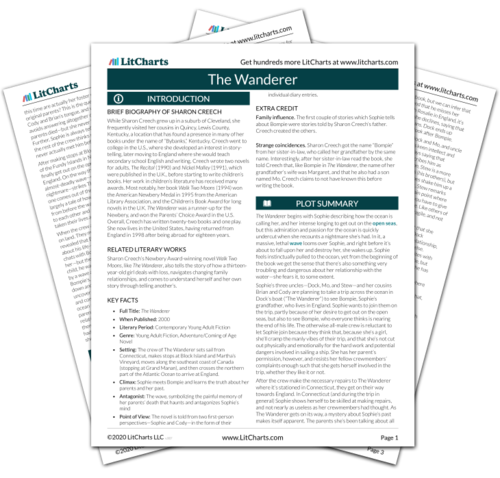 Get the entire The Wanderer LitChart as a printable PDF. Cody also says that Sophie went up high in the bosun’s chair (a sling which lifts up to the mast) after Brian refused, as he got nausea just from the sight of the tall spire of the mast. Sophie excitedly and adeptly ascended the mast, and changed a burnt-out bulb, totally unafraid of the height, unlike Brian and Cody. Sophie’s lack of fear when climbing the mast challenges the male crewmembers’ perception of her as a girl prone to being easily scared. Here, she demonstrates that she actually has more bravery than her two male peers. 9. Beheading. Sophie writes an entry saying the crew has left Block Island and is headed for Martha’s Vineyard. Cody, she adds, annoys his father (Mo), Brian, and Uncle Stew by never saying any of the sailing terminology correctly. She says that they arrived at Martha’s Vineyard in half the time they expected, and that the reason they’re stopping in Martha’s Vineyard is to visit Uncle Dock’s friend Joey. Joey has spent the last five years refurbishing an old wooden boat, and it’s in impeccable shape with a high-end interior. Sophie says that Dock seems a bit jealous about Joey’s boat. While Sophie and Dock both admit that Joey’s ship is beautiful, they agree that they’d rather sail across the ocean in The Wanderer. After everyone has dinner in Joey’s cottage, Cody tells Sophie that he walked in on Dock and Joey having a serious conversation—but he’s not sure what it was about. Cody’s lightheartedness and tendency to goof off grates on the nerves of Brian and Stew, who insist that using the proper words in order to describe the various parts of the ship is critical to everyone’s safety. Further, Sophie and Dock’s dedication to The Wanderer is emphasized here, as they prize its quaintness and the feelings it gives them over the luxury and impressiveness of Joey’s boat. Cody’s description of walking in on Dock and Joey is mysterious, and we’re left to feel like there is something happening in the adult world which Cody, Brian, and Sophie don’t have access to, but which somehow concerns their trip. Here, Cody’s starting to recognize how Sophie can be amazed by some of the most seemingly simple things in life—a trait of hers which he will notice even more when they’re docked at Grand Manan. 11. Juggling. Sophie writes another entry, and says that Cody is still getting on Mo, Brian, and Stew’s nerves by refusing to use the proper sailing terminology. Brian tries to teach everyone points of sail (ways to describe a boat’s orientation to the wind), but Cody can’t take him seriously, and they get into an argument. Later, Cody gives everyone a juggling lesson, but Brian says that juggling is stupid, and another argument ensues. Sophie says that the crew are about to set sail for Nova Scotia, and that this will be their first time out on the open ocean with no sight of land. Cody keeps refusing to succumb to the pressure to conduct himself in a more serious manner. Yet Brian also refuses to lighten up and have fun participating in the juggling lesson—an activity where sailing techniques aren’t directly involved. The two therefore represent polar opposites when it comes to their personalities. Sophie’s anticipation about what the open ocean will be like is getting more intense. 12. Blah-blah-blah.Cody says that it’s been a stupid day. Brian was “blah-blah-blahing about points of sail”like a know-it-all. Further, Brian asked Cody if he liked Sophie better than him, and Cody replied, “Yep.” Cody writes that Sophie is going to tell her first Bompie-story tomorrow. Cody and Brian’s conflict keeps brewing; Brian is really getting on Cody’s nerves, and Cody is willing to admit his dislike for Brian to his face. This initial rejection by Cody will set the tone for their relationship going forward. 13. Shakedown. Out at sea, Sophie writes about how her sense of time is being warped by being out on the open ocean. She says that, out there, “there isn’t day and night and the new day.” There’s no yesterday or tomorrow—time is just one big now, one massive present moment. Sophie’s earlier description of the ocean as a place where all time is connected comes alive here. Faced with the vast,seemingly limitless stretch of sea across the horizon, it seems like days can’t measure the sense of vastness she feels. Sophie says that when she was on watch, peering through the fog, she suddenly had a bout of loneliness—and felt like she didn’t want to leave North America. She says she didn’t have long to be mournful, though, since she had to get back to work to steering the boat: the wind had picked up and the waves started to swell. Here Sophie has her first doubts about the voyage. The pull she feels towards the ocean lets up, and feelings of fear threaten to push her away. Again, the “push-pull” dynamic to Sophie’s relationship with the water is at work. 14. Bompie and the Car. Cody writes an entry about the first Bompie story Sophie tells aboard The Wanderer. Bompie lived on a farm when he was young, and his family had little money. One day, they traded two mules for a car, and Bompie agreed to go into town to pick it up. As he was driving home it was pouring rain, and he got to a creek that he had to cross—but there was no bridge. So he drove the car into the creek, but the streaming wall of water flipped the car over. Bompie managed to get out, but he lost the car, watching it float all the way downstream. When he finally got home, Sophie says, his father whipped him, and his mother gave him an apple pie because she was happy that he was alive. Brian doubts that Sophie is telling the truth, because he thinks there’s no way she’s ever actually met Bompie. Sophie’s stories about Bompie—which we learn later are not totally her inventions, but rather tales of Bompie’s life which he wrote down in a series of letters to her—will often involve Bompie somehow falling into a body of water, then being whipped by his father and given pie by his mother. Sophie is clearly fascinated by Bompie’s life, and perhaps sees more than just excitement and adventurousness in Bompie’s often dangerous encounters with water: she seems to find some deep meaning in them, and to feel that they have a powerful significance to her own life. Iffland, William. "The Wanderer II. Shakedown." LitCharts. LitCharts LLC, 23 Dec 2016. Web. 25 Apr 2019. Iffland, William. "The Wanderer II. Shakedown." LitCharts LLC, December 23, 2016. Retrieved April 25, 2019. https://www.litcharts.com/lit/the-wanderer/ii-shakedown.